If you work in an office, a number of factors have probably already been considered to accommodate sitting at a computer desk all day, such as chair height, distance from the monitor and body posture. Special accommodations are also taken in other workplace settings to address ergonomic issues such as product storage, material handling and how the fixtures within a facility are used. But there are places beyond the workplace where people spend a great deal of time sitting. So how do ergonomics translate to the driver’s seat? The most common complaints reported by drivers include low back pain, sore shoulders, stiff neck and foot cramps. Fortunately, there are a number of ergonomic adjustments you can make in your vehicle to reduce stress and strain on your body. Move the seat forward to enable you to comfortably depress the foot pedals all the way down with your knees bent while keeping your back against the seat back. This should aid in foot cramps and back pain. Adjust the headrest so it’s in the middle of your head. Keeping the head back and neck in a neutral position will ensure correct positioning and posture. Shoulders should rest somewhat behind the hips. Next, recline the seat slightly back to decrease pressure on the discs in the lower back. Bring the seat height up so that your hips are aligned with your knees (if you are too low, consider adding a cushion to the seat). Ensure your seat isn’t adjusted so high that it affects your headroom. Slouching your head down or bending to the side will cause problems in your neck and back. Good lumbar support is an important factor to alleviate back pain. If the vehicle does not offer adequate support you can use a portable device or a cushion behind the back. There should be comfortable support without pressure points or gaps between the spine and seat back. One additional ergonomic tip: never sit on your wallet. The low back, hips and pelvis will be uneven and will ultimately cause back pain while driving. Posture is another important element in successful ergonomics. Maintaining good posture eases the strain on your body. If posture is not something you’ve ever paid much attention to while standing, sitting or lying down, you may have to train your body how to reposition and make good posture a habit. Once you have adjusted your seat to your appropriate settings, adjust your mirrors. If you habitually slip into a bad position or slouch, the mirrors will be your cue to straighten up and readjust. 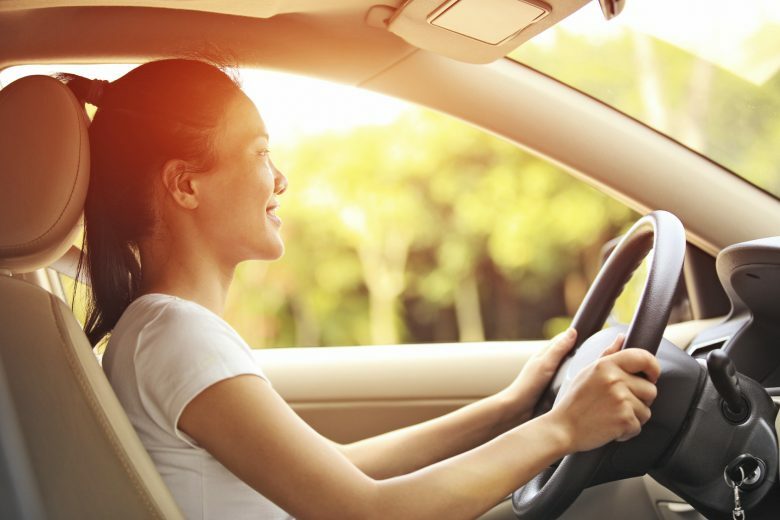 Although 10 and 2 is probably ingrained in your mind from your early days of driving, the best position for your body while driving is to have your hands at 9 o’clock and 3 o’clock. Not only is this recommended for a safer position if airbags are deployed, this will eliminate the arms being kept in a raised position, which causes strain and pain in the neck, shoulders and upper back. The less your elbows reach forward means the strain on your body will be minimized. Ensure that the steering wheel is adjusted so that it does not come into contact with the legs and allows you to maintain an unobstructed view of the display panel gauges from the position you’re sitting. Just like in an office setting, frequent breaks are required while driving too. The standard is to take a short break for every hour of driving. During these breaks, it’s important to get out, walk around and do some stretches to reduce the amount of stress that was put on your body by remaining in the same position for that time period. It’s also important to take a break as soon as you finish driving—don’t immediately try to lift heavy objects out of your vehicle. The body needs time to get the blood flowing and the muscles to engage after remaining in the same position for a long period of time. Be sure to practice good manual handling techniques when it’s time to remove the items from the vehicle. Driving a vehicle can be more detrimental than sitting or standing job functions when it comes to repetitive stress injuries (RSIs). This is because of the prolonged sitting, constrained postures and low-frequency whole-body vibration from sitting in the vehicle. Much like office ergonomics, it’s important to take proactive measures to ensure the comfort of your driving and the prevention of RSIs. For more on how ergonomics can make work safer check out SafeStart for Personal Ergonomics.